Silk thread for quilling jewellery. 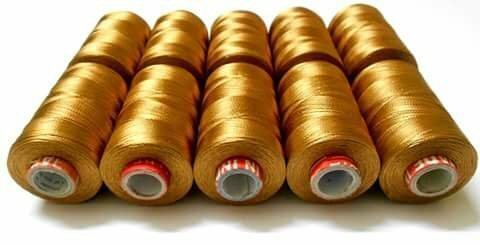 An exceptionally strong and color-fast rayon thread in Desert Gold colour. The product of choice for many high-end designers in the garment industry for their embroidery designs. Used for embroidery, festoon work, ornamental seams, and many other decorative applications on high speed machines and is also highly demanded by hand embroiders. Silk Thread is highly used in wrapping jewellery bases and also in handicrafts and other craft work because of its shiny and lusturous texture. This attractive embroidery thread is highly lustrous, colorfast and and has both, a high breakage resistance and a high abrasion resistance. Used in embroidery, applique and hand work. Colorfast, both washable and dry cleanable. Can be used for top-stitching, quilting and satin stitch decorative stitches. Best for computerized designs too. If you have any questions about this product by GOELX, contact us by completing and submitting the form below. If you are looking for a specif part number, please include it with your message.